Welcome to Deadpioneer's Historic Minnesota Highways! This site is my way of documenting my quixotic quest to map and explore the historic highways of the great state of Minnesota. The vast majority of historic documents I use to do my research are available for free on the web. I get most of my information directly from the Minnesota Department of Transportation. Roadway Data - The primary portal for obtaining information on Minnesota's trunk highways. Construction Project Logs - These documents provide an overview of the history of the trunk highway network and are the primary starting point for my research. Historic Roadside Development Structures Homepage - Several years back Mn/DOT did an inventory of historic roadside structures still under their jurisdiction. This page provides access to various reports and documents. MHAPO (Minnesota Historical Aerial Photos Online) - Your one-stop historic aerial photo stop for Minnesota! Provided by the Borchert Map Library at the University of Minnesota. USGS Earth Explorer - This rather complex interface allows you to view and download a myriad of different aerial photos and other products. MapRamsey Viewer - Another online mapping tool. This site allows for viewing and comparison of aerial photos from 1940 through today for all of Ramsey County. Minnesota Digital Library (Home) and DOT Page - This site allows for the viewing of nearly every official highway map produced by the Department of Highways since 1919, as well as many other documents including motor trail authorizations and the Department of Highways employee newsletter "Minnesota Highways" which provides great photos and info on past construction projects. Winona Newspaper Project - A site that provides fully searchable articles from Winona's historic newspapers. The Minnesota Historical Society Library in St. Paul. Sometimes referred to as "Road Geek" sites, these sites are put together by several other folks who are just as, or more obsessed, with Minnesota highway lore than me. Tales of the Road: Highway 61 - The companion site to Cathy Wurzer's award winning documentary and book. The Unofficial Minnesota Highways Page - by Steve Reiner - I probably would have never started this project if it weren't for Steve Reiner's site, which gave me the foundation I needed to start my research. 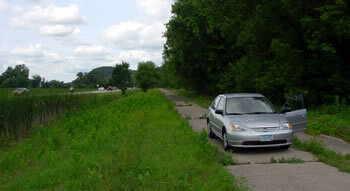 His site is a definite first stop for anyone remotely interested in Minnesota highway history. HIs site provides information on all of Minnesota's numbered routes, past as present, as well as background information on their legal basis. Froggie's Place - A site with a ton of information on Minnesota highways (plus other states), including exit lists and information on proposed highways that were never built. Northstar Highways - Some great information and photos of old infrastructure around MInnesota. U.S. Highways: From U.S. 1 to (U.S. 830) - The unofficial bible on U.S. routes. U.S. Ends - One of my favorite pages for general info on U.S. routes. One of the few sites out there that provides good, clear maps of route extents. The Truckers Report - History of the Interstate Highway System - A collection of links to articles on the history of the national route system in the United States. Wisconsin Highways - by Christopher J. Bessert. The Iowa Highways Page - by Jason Hancock. The Unofficial South Dakota Highways Page - by Chris Geelhart. North Dakota Highways - by Chris Geelhart. Ontario Highways - by Christopher J. Bessert. I make heavy use of the Google Maps API to provide interactive maps of historic highway alignments. The information shown on the maps is in either JSON or KML formats, and edited using ArcGIS or Google Earth. The static maps on the site have been created using several pieces of software including Adobe Fireworks, Adobe Illustrator, and ArcGIS. All of the color photographs on the site are from my own collection unless otherwise credited. I currently use a Canon G11 and/or a Canon T5i. Older photos were taken with a Nikon Coolpix 5200. If you would like to use one of my photos for non-commercial purposes, please drop me an email (see contact info below). I am 99.9% sure that I will allow it, as long as appropriate credit is given. Hi, I'm Andrew Munsch. 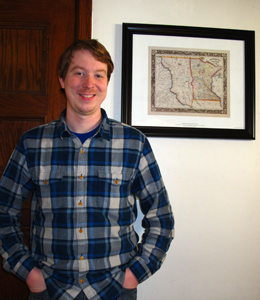 I am a GIS Info/Tech Specialist at the University of Minnesota. I earned a Master of Geographic Information Science from the U in 2014, and earned a B.S. in Geography in 2003. I currently reside in Minneapolis. When I'm not working on this site I like to dabble in Rock and/or Roll. If you have any questions, suggestions, or corrections for me, feel free to email me: andrew@deadpioneer.com. This site is hosted by Dreamhost and created using Adobe Dreamweaver.